Founded in 1985, the Italian language school for foreigners, STUDIOITALIA, has been one of the most important Italian language teaching centers in Rome for the past 30 years. 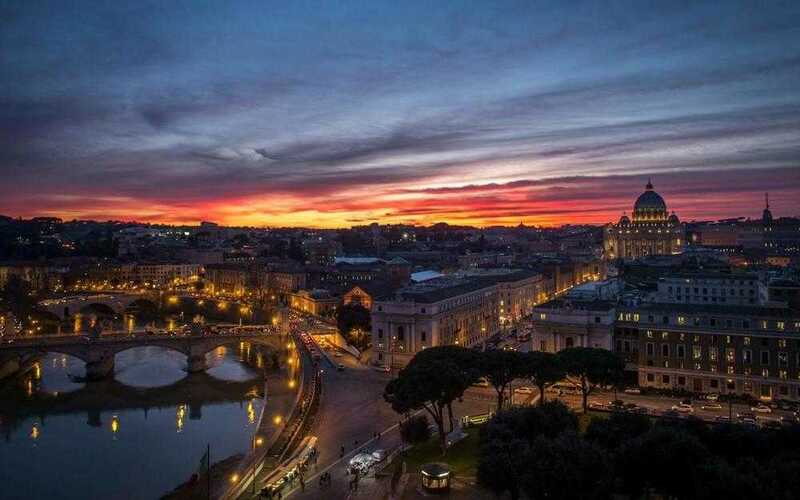 It is situated in the heart of Rome, merely 5 minutes from St. Peter's Church and just off Via Cola di Rienzo, one of the cardinal commercial streets of the city, right behind Piazza del Popolo. Around the school there are restaurants, cinemas and a wide variety of shops. The whole area is also very well connected to public transport, and there are two metro stops, OTTAVIANO and LEPANTO, very near to the school. In order to ensure the highest level of quality of the course as well as the relationship between students and teachers, the school accepts a maximum of 10 students per class. This type of small classes guarantee that every student has a chance to practice their language skills and to participate actively in each lesson. This is by far the most requested course. It combines multiple hours of lessons (20 hours per week) with a relaxing and friendly atmosphere. You can enroll for just a week or for months at a time. Mere four lessons hours a day ensure constant and regular contact with the Italian language and help to develop a strong relationship between teachers and students. Students learn how to use the Italian language in real life situations, which can be applied to day to day activities while studying Italian in Rome. The Intensive-Plus Course is a full-immersion path. The 6 lessons, which are held everyday, accelerates the student's ability to understand the language and speak freely within a few weeks. The didactic activities require commitment and are intended to enable students to reach the highest possible standard of Italian in the minimum amount of time. It is specifically created for students who need to learn Italian quickly and whose stay in Rome is quite brief. Important: the students taking this courses are eligible for a Study Visa. The School will provide an invitation letter, should the stay be of, at least, six months. Studioitalia seeks to meet students' needs, therefore, we are able to organise courses for different purposes. Communicating efficiently and clearly is a fundamental aspect of doing business in the global marketplace. By utilising real-life scenarios, we have created a course that will offer insight into commonly used vocabulary, phrases, and expressions that have practical applications. You will examine Italian grammar analysing specifically the best ways to apply it in order to communicate your ideas. We will look at a number of topics, such as how to write a business letter or email, how to talk about work duties, and how to present and describe products and services. This course will boost your confidence to express yourself professionally in a variety of situations. Individual Courses are ideal for the students of the school that want to learn Italian in a totally relaxed and informal atmosphere. It's even possible to have a lesson out of the classroom and enjoy the school's ideal location in the centre of Rome. For example a student can learn the language from the teacher while walking around St. Peter's Church and St. Angelo's Castle or by simply "living" it with the teacher in an every-day context such as buying groceries or having a cappuccino. Important: the students taking this course are eligible for a Study Visa. The School will provide an invitation letter, should the stay be of, at least, six months. 1 full day, 6 half day and 2 evening excursions for students per week. Io ho frequentato un corso d'italiano di due mesi nella Accademia Studioitalia e mi sono divertita tantissimo!! La mattina facevamo lezioni e poi il pomeriggio c'erano delle attività volontarie tipo cucinare, fare un giro per la città, guardare un film in italiano, ecc...Anche tu puoi proporre qualunque altra attività!! Mi sono trovata benissimo, i gruppi sono piccoli per questo penso che sia meglio nel senso che puoi chiedere tutti i tuoi dubbi, anzi, se bisogna si può fermare la lezione per spigarlo. Anche, così e più facile fare amicizia, conoscere meglio gli altri studenti e insegnanti. Alla fine diventa quasi un famiglia. A me mancano un po'... vi saluto!! Ho frequentato un corso d’Italiano per una settimana. Mi sono divertita un succo. Una settimana lezione era troppo breve,vorrei venire a qui ancora al piu presto possible. I have spent one week at StudioItalia. Teachers are friendly,kind and enthusiastic. The lessen was focused on conversation. At the same time teachers instructed grammar in detail. Sometime we used quiz and game. I had a lot of opportunities for communicate in Italiano. I could meet classmates from a variety of countries. I think one week is too short. Next time I would like to stay longer. The school is located neat Vatican,sophisticated and quiet area for locale people. There are lots of cafes and restaurants around there. This school is highly recommended. I remember the first day I came to the school. I arrived 30 minutes earlier than it opens, there I met a gentleman who tried hard to explain me that I need to wait a bit. Well, after the 5th try he just smiled and left... That time I had in my baggage no more but 6 words (to notice, "ciao" I considered as two different words). I had a reason to learn the language, but no love toward it. From the first lessons I got something under my skin. And day after day it was growing purposely. Comparing with the other students I had a lower level and no talent to the language, despite that I never felt left on my own. All of the teachers spent a lot of time and attention to help me catch up the level of my classmates. Their attitude to each student, love to the language (their job!) and a wish to share knowledge about Italian culture with foreigners are something invaluable. I am thankful to each of this professional staff for making me fall in love with Italian language and bringing me after 8 weeks of study to the level A2-B1. P.S. what was my surprise when I could speak over our day with the gentleman I met on my first day! the dependence in rome is great, had a good time and it helped. Напишу свой отзыв и я, итак... Я начала учить (играючи) итальянский в конце марта 2016 года. СКАЖУ СРАЗУ, это даже учебой назвать трудно ибо учебный материал заходит очень легко. В связи с тем что, школа старше *своих учеников , это делает ей хороший ОГРОМНЫЙ ПЛЮС, в связи с опытом подачи материала ну и разрешения рядовых ситуаций. Учителя стали мои друзья мгновенно!!!! Ну и о том что с тобой в классе учатся люди со всего света , это такое удовольствие , общаться и знакомиться с разными культурами при этом изучать язык Данте всем вместе. Как не грустно, но для меня закончилась маленькая жизнь! Ive enjoyed my 6 months here, highly recommended! Nauka języka bez stresu i dzięki temu bardziej efektywna i satysfakcjonująca. Nauczycie otwarci, z poczuciem humoru. Tworzą super atmosferę. To było super doświadczenie! I lokalizacja- tuż obok Watykanu. Polecam! Отличная школа рядом с Ватиканом!